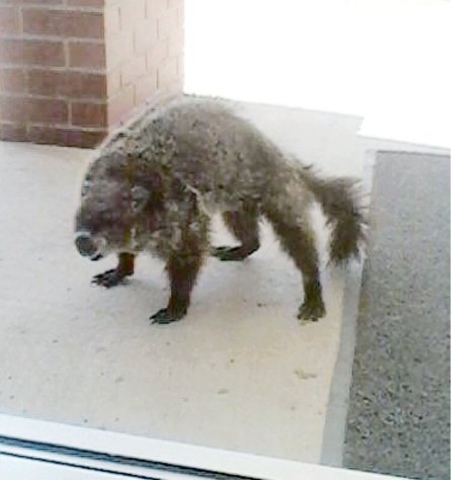 Residents of a nursing home in southern Iowa received a visit from a bedraggled animal recently, and my hometown newspaper published a photo of the critter with a headline that posed the question of whether this was a wolverine? Local wildlife experts expressed doubts of the wolverine identification, but also expressed uncertainty as to its actual identification. I posted the photo on my facebook page and asked my colleagues to comment. As of today, most agreement seems to be that this is a very wet, probably very upset woodchuck. The white markings on the nose and behind the chin make me agree. What do you think? Photo from the Creston News Advertiser. The story can be accessed through the link. Thanks to Mom and Dad for sending me this story!